Pairing liquor with food can be tricky: high-test alcohol has the potential to overwhelm the palate and obliterate the flavors of the food. But it can be done, as long as the dish is bold enough to stand up to the boozy beverage while simultaneously harmonizing with it. Some women like diamonds ... I prefer liquor. This incredibly smooth and complex spirit features notes of smoke, toast, butterscotch, sage, and a very subtle fruit finish. The smoky peatiness of the mezal reminds me of Scotch, which got me thinking about game meats and fowl. I settled on a Moulard duck magret (half breast) from D'Artagnan, rightly supposing that the fatty unctuousness of the meat would handily stand up to the booze. 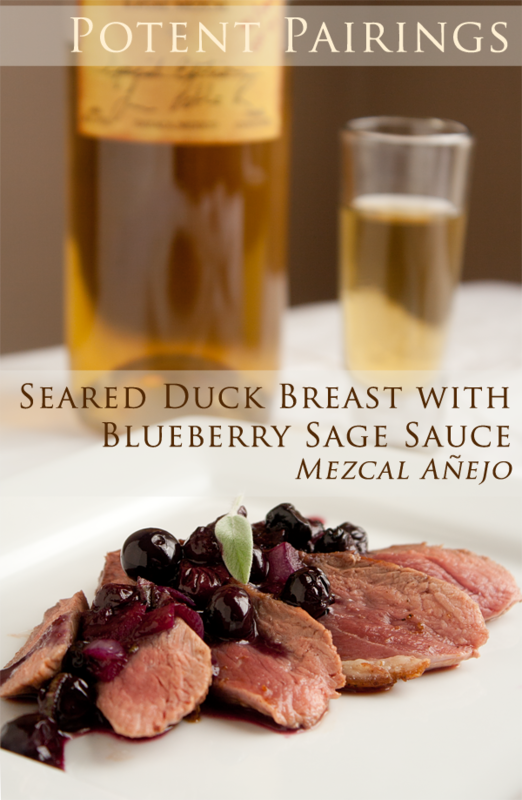 And to cut through that rich duck fat and pick up on the mezcal's slight fruity finish, I made a peppery, ever-so-slightly-sweet blueberry sage sauce with - what else? 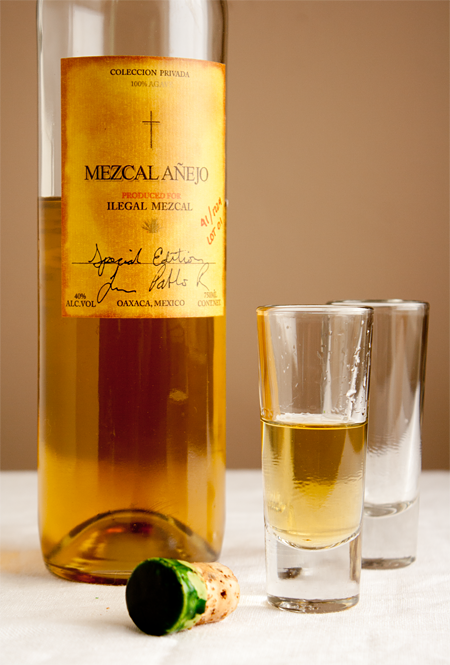 - a splash of mezcal. To sear the duck breast, I followed Dorie Greenspan's method for medium-rare breasts: Score the skin diagonally to make a diamond pattern, taking care not to cut the meat. Sear, skin side down, in a skillet over medium high heat for 8 minutes, turn and cook for an additional 6 - 7 minutes. Greenspan has you place the breast in a 250 F oven to keep warm; I prefer to simply cover it and let it rest before slicing it. Make sure to save the rendered duck fat for other uses, like frying potatoes! In a small saucepan, saute the shallot over medium heat until translucent. Add the mezcal and simmer for a few moments. Stir in the demi glace. Add the blueberries and sage and lower the heat. Simmer gently until the blueberries are soft and release their juices, but not until they are falling apart. Depending on how sweet they are, you may need to add just a pinch of sugar at this point. Salt to taste and generously season with cracked black pepper. Serve spooned over the duck breast. You can plate it up all fancy if you want, as I did above, or, for a messier dinner, place the duck and sauce over a big bowl of creamy polenta. It doesn't look as pretty, but it's a great combination. I am already hard at work tasting liquors for future pairings (I take my work seriously), but if there's a liquor you'd like me to feature in a future Potent Pairings, let me know in the comments! This is absolutely gorgeous and I love the name of this new series. Can't wait to see what you do next. Yeah! A series! I love the pairing of sage in this dish! One of my favorite flavors and herbs yet so underused I think. 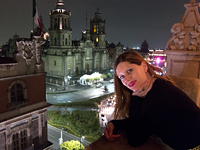 And I"m intoxicated just looking at that mezcal bottle! Me wants! I love this new series.A clever and fun excuse for some serious creative experimenting. This dish looks amazing...very intrigued by the pairing and I could use a shot of the liquor right now. Crazy day at work! You had me at "First, I choose the booze..."
I always knew you were a girl after my own heart... booze beats bling any day. Great little combination you've got going there Trix.. Brava. Photos of the duck are great too.. D'Artagnan would be proud!! That is a dangerously awesome pairing!! I love the new series Trixie! I know your going to create many stellar dishes, like this one. What a great and unique combination of flavors. 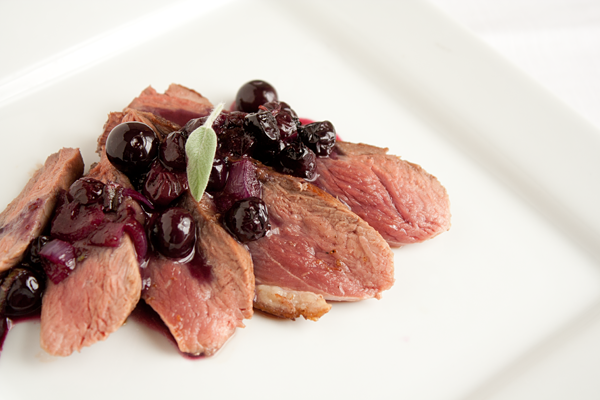 One of my husband's favorite meal, here in Prague, is duck breast cooked in a plum sauce. I know we would both really love yours. Your photos are fantastic! Have a great weekend amiga. This looks so much better than the Carrot Salad…so wonderfully delicious!! Your duck breasts look perfect! Very nice post, Trix! oooh, this looks amazing - loving those plump juicy blueberries in the sauce. This is a stunning masterpiece. And enlightened combination of ingredients. Brava! 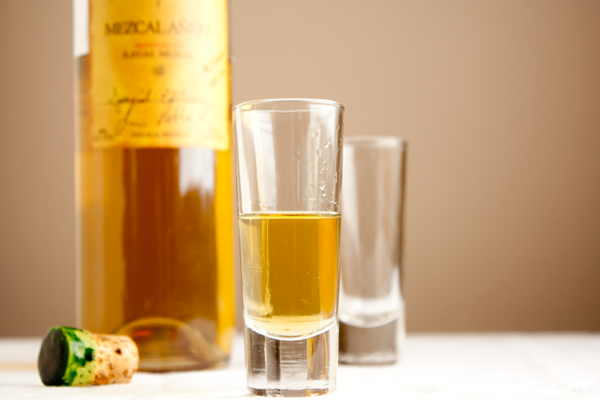 of course, you had me at mezcal as I read on the drive yesterday, drooling my way into NOLA.. a very fine triple play of flavorful, savory 'pairings' .... yea, I am gonna love this series. Love this 'potent' series Trix! 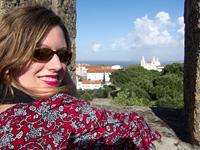 Wow, Trix, your photos are magazine worthy...just gorgeous! The hubby would adore this duck! HI TRIX!! This should be on the front cover of F&W, at the least! GORGEOUS! Greg, that's how I do bacon (and duck bacon) to render the fat and get it nice and crisp. Here, though, I was worried to cook it for too long so I started on a hot pan for accurate timing. I would love to try your method though - how long do you cook each side, and at what temp? If you are getting breast implants you may be thinking about going for cheap Breast implant Delhi.